HydroMassage is a convenient way to get the therapeutic results of a traditional hand massage, without the time constraints. 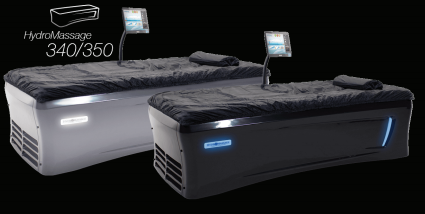 The bed allows you to lay down, fully clothed, and enjoy customized water pressure on all areas of your body for as little as 10 minutes. Great for pre-workout and post-workout massage. Hydromassage is more cost-effective than traditional massages, offering most of the same benefits for the mind, body, and soul. Take on UNLIMITED Hydromassage, Spray Tan, and Tanning Bed services for just $85/MONTH or $1020/13 MONTHS. *No transfers or holds on services. Prices subject to change at end of agreement. Reservations can be made within a 24 hour period. Member prices. Non member prices vary. RFC is such a well run gym. The staff is always friendly and professional. The equipment is well maintained and up to date. There are a variety of classes throughout the day and evening to meet all your needs and help you achieve your goals. Thanks RFC for all you offer. If you want to work with a great team, be encouraged, safe and get results, RFC is the place to be! As a former member and employee, I can honestly say I never felt more comfortable in a gym atmosphere than I do at RFC. Miss it and know you will get great workouts and programming as well as awesome service when you're there! RFC is the best gym I've been involved with. I'm 61 and have always enjoyed a regular gym workout schedule. Their key ingredients are a friendly staff and a huge variety of classes. I highly recommend RFC.